Climb to the top of Sundered Towers. Kill the Forsworn Leader and retrieve the sword Red Eagle's Fury. Place Red Eagle's Fury into the holder to open the door. Retrieve sword that is now called Red Eagle's Bane with different stats. This quest starts when reading the book The Legend of Red Eagle, and is found in the Miscellaneous section of your journal. The first waypoint leads to Red Eagle Redoubt, an outdoor encampment with a couple Forsworn and some minor loot. Next head into the cave Red Eagle Ascent. There's not much to speak of in here, just a handful of Forsworn, a few easily-avoided traps, and some alchemy ingredients in various places. At the end of the cave you'll exit back out into Skyrim through an exit marked Red Eagle Redoubt (not the same door through which you entered). Head up the stairs to your right and kill all of the Forsworn along the way. Note that once the stairs end there is a sizable camp to the left with a forge, an alchemy lab, a locked chest (Adept), and the Alteration skillbook Reality & Other Falsehoods. To the east of the camp (to the right as you reach the top of the stairs) is the large stone structure Sundered Towers. The structure is actually the personal encampment for the Forsworn Briarheart, who you find seated at a throne as you approach. Kill him in order to retrieve Red Eagle's Fury. The quest will auto-update and ask you to unlock the secret of Red Eagle's Tomb. There's a journal on the altar near the Forsworn Briarheart with details on what you have to do, as well as a nearby chest. Don't forget to grab the key off of the Forsworn Briarheart's body. Head back across the throne and up the wooden stairs to a master locked door, which unlocks with the key you just found. Follow the path up the tower (there are no enemies nearby) and use the pullchain to lower a drawbridge you need to cross to reach your next destination. Once you cross the bridge, you can loot some items here, and go downstairs to a door. You exit the tower facing east. You can see ruins to the north, which are empty but do provide a nice view. The next destination is Rebel's Cairn, to the southeast. Rebel's Cairn is not the tower you can see in the distance to the southeast; that tower is Bleakwind Bluff, which you may want to discover if you haven't already. Rebel's Cairn is located before you reach that tower. Upon entering Rebel's Cairn you will find a good amount of fungus-type alchemy ingredients (some of which you may need to use Whirlwind Sprint to access), a dead adventurer, an iron ore vein, and an altar with a weapon slot. Activate the weapon slot to insert Red Eagle's Fury, which will open the way ahead into Red Eagle's tomb and the next phase of the quest. The top of the first flight of stairs here triggers a trio of skeletons and Red Eagle himself to rise. If you are sneaking, it seems that the skeletons sometimes turn on Red Eagle himself, so it may pay to initially stay out of sight and take some pot shots at Red Eagle while he dismisses the skeletons. Take them out how you see fit, although do note that Red Eagle can raise the skeletons, so you might want to take him out first (the skeletons are actually summons; after a while they may collapse on their own). You can also head around to the far right or left behind some spiked sticks to give you some cover from Red Eagle (while still leaving you room to attack him). Once defeated, Red Eagle will drop a honed ancient Nord greatsword of burning. A chest behind Red Eagle's coffin contains some loot. Head back out to the first chamber and grab Red Eagle's Fury, which is now Red Eagle's Bane. If Red Eagle's Fury is removed from the pedestal after Red Eagle is awakened but before he is killed, it will not become Red Eagle's Bane. If Red Eagle's Bane is removed from the pedestal, the door closes so be sure to remove all the loot from the tomb if you intend to sell the sword. The final quest area does not provide an easy exit back to the beginning. Thus, if you typically travel with a horse, you'll need to walk all the way back to Red Eagle Redoubt to retrieve your horse if you are over-encumbered. When you activate the pedestal, the model for an ancient Nord greatsword is placed inside instead. After completing this quest, reading another copy of the book will assign the quest again. However, Red Eagle will not be there, and Red Eagle's Fury will not become Red Eagle's Bane. Keeping Red Eagle's Fury in your personal inventory does not stop the quest from being reassigned. Picking up another Red Eagle's Fury sword will make it a quest item and it cannot be removed from your inventory by dropping it. 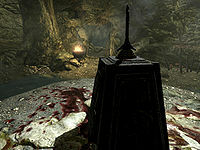 You must travel to Rebel's Cairn and activate the weapon slot in the first room to have it removed from your inventory. Alternately, if you own a house, the weapon plaques can be used to remove quest marked weapons from your inventory. This issue has been addressed by version 1.3.2 of the Unofficial Skyrim Patch; The quest will no longer restart itself after completion, which is what led to this bug. The book Red Eagle's Rite on the altar at Sundered Towers might clip beneath the surface making it unreachable without the console. You can knock the book into view by using a shout or spell. Sometimes the Forsworn Briarheart carrying the Red Eagle's Fury sword will carry duplicates of the sword in their inventory. At this point, it is unknown whether this happens because of the quest reassignment or a normal bug. The swords are able to be dropped, sold, or stored after you use one to open the secret passage to complete the quest. ? The following empty quest stages were omitted from the table: 0, 20, 21, 30. On the PC, it is possible to use the console to advance through the quest by entering setstage dunRebelsCairnQST stage, where stage is the number of the stage you wish to complete. It is not possible to un-complete (i.e. go back) quest stages, but it is possible to clear all stages of the quest using resetquest dunRebelsCairnQST. This page was last modified on 22 November 2018, at 03:52.